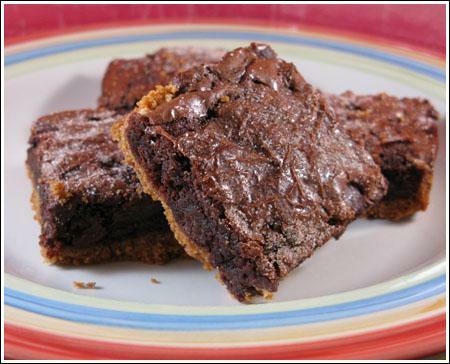 Mexican Chocolate Crunch Brownies are perfect for Cinco de Mayo. To make them, you pour boxed brownie batter over a crust made of crushed Cinnamon Toast Crunch cereal, butter and corn syrup, then add a cinnamon and chocolate chip topping. They’re fairly easy to put together and in my opinion, very creative. Recipe (with reviews) is here. i live in houston and don’t know where to buy maracas! aw. thanks for “featuring” my recipe. I just got back from my appearance at a local grocery store. they baked up 6 batched of my brownies to hand out and they had a little congratulatory ceremony and photo-op for me. I got two big gift baskets and a $100 gift card. I would stick with the cinnamon toast crunch cereal, myself, as opposed to using the graham crackers. the GC’s would work, but I just don’t think they’d be as good. that’s just my bias, though. I have made them and left out the corn syrup and they work fine. it is just there to bind the crust but not essential. I usually leave it in, though, just in case. cinnamon chips work. the brownies aren’t quite as fudgy that way, but still good. and some people don’t care if brownies are fudgy or not. Ah, how nice of you to feature Val’s recipe! I’ve been wanting to try this. And since I almost always have Cinnamon Toast Crunch cereal in my pantry due to my 6 year old’s obsession with it, I should be making this soon!